I'm positively DYING over here. LOOK at that gorgeous old 200K. Trying desperately to control myself and keep my eye on the Carr-ball. This thing is totally not needed but.. but.. (lipquiver) just.. look at it. I hear you. I prefer black hardware too, but that is a real beaut. 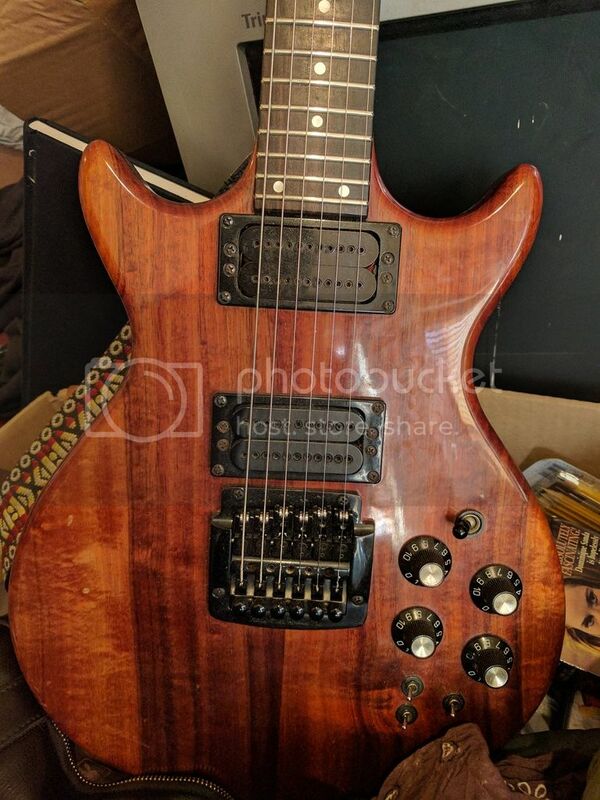 I bet it pushes out that beautiful, warm yet bright, hog/ebony Les Paul Custom sound these axes (100/150/160/200) were famous for in the 1st half of the 80's during the set neck, 24.75" era of Mark's luthiery. Especially when they were solid koa and ebony rather than maple/ebony. 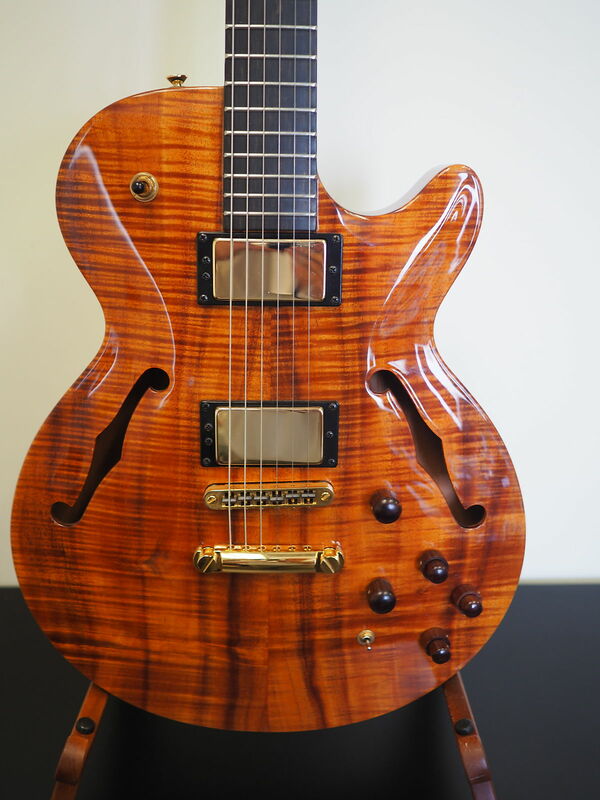 That is real deal old school stripey koa... deep rich and blazingly chatoyant. All my posts of my beloved got wiped away due to photoblecket..
Well, but that's a nicer shot anyway . . .
Lost a bunch of stuff on pbase a few years back. Always a pi$$er . . . Thanks G. I hope you're well my friend! 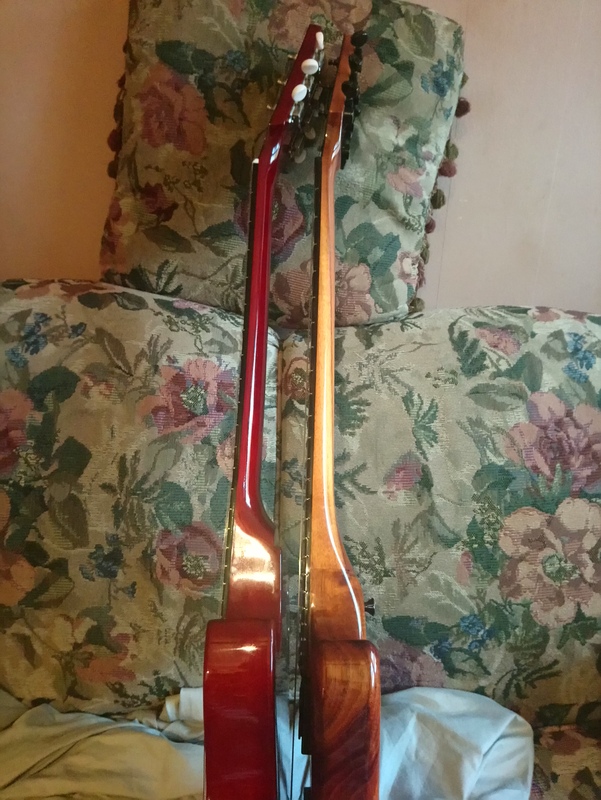 What's always amazing to me at an angle like that is how the chamfered edge on both sides of the slab makes it look like it's thinner than your basic LP Special or Junior, but it's not. A look at the neck at body-width at the bottom of the flare-out after the joint gives a clear picture of the thickness of the slab. Thanks, think I may have died last year but I'm just too stubborn to admit it . . .
Nope, still breathin . 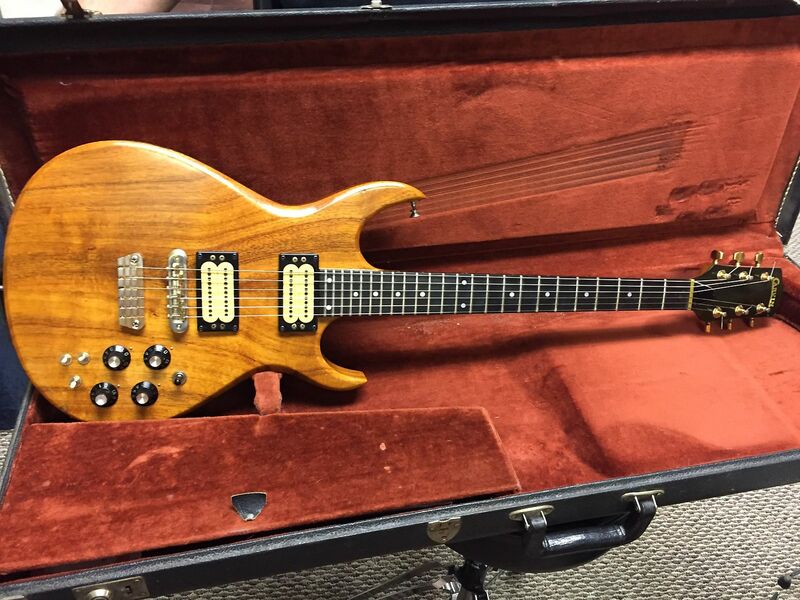 . .
You know, I'm not fond of bevels, but that thing is SA-WEET! Love the unusual grain and perfect mirror! 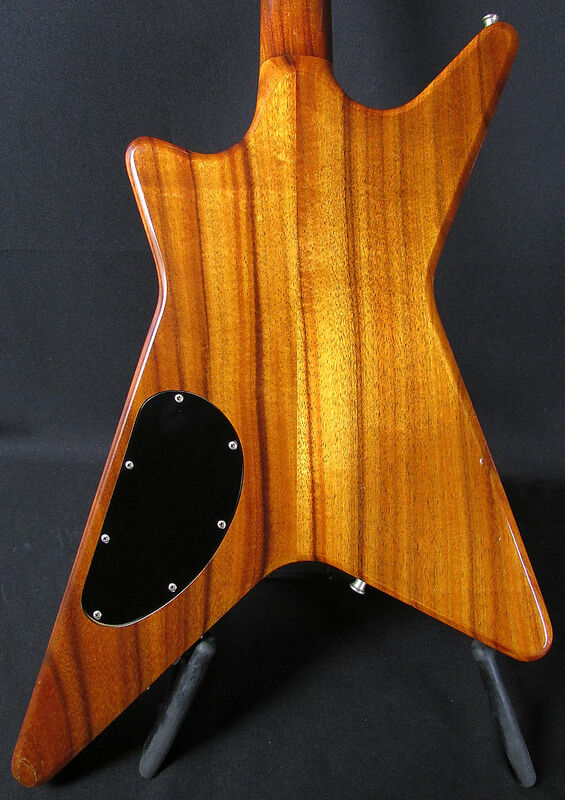 Looks a little like a walnut koa best of both worlds blend . . . 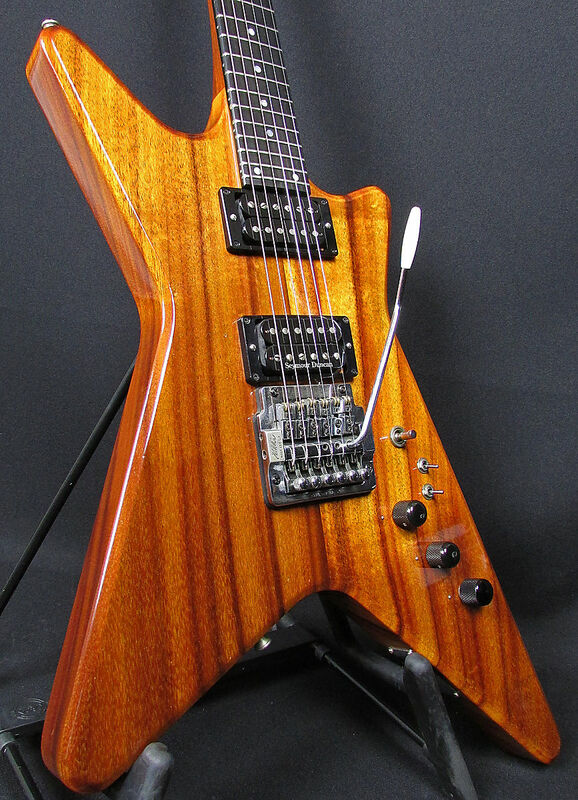 It is, it's a walnut guitar primarily: a koa top with a lot of figure laid over the main walnut body/thru-neck. So much wish I would have thought more about how much this ole girl would weigh being solid walnut ~ nearly 14 lbs. Don't think they had chambering available yet though?? Just played it and this thing plays and sounds OH SO GOOD! But, man what a brick . . . even sitting on the couch, didn't take but a few minutes for right leg to go to sleep. 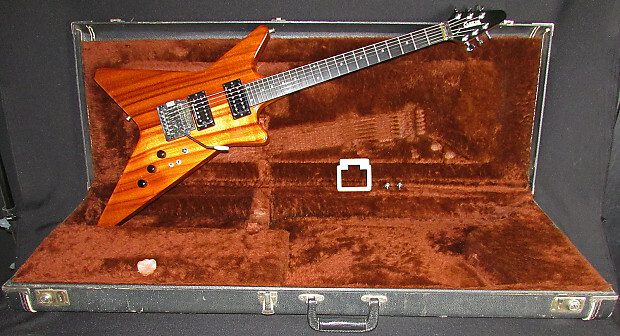 Another Carvin work of art though! canon_mutant wrote: So much wish I would have thought more about how much this ole girl would weigh being solid walnut ~ nearly 14 lbs. Don't think they had chambering available yet though?? wow my walnut LB is only 10! Yup, I actually think they weight added to it somehow. It is quite a brick. 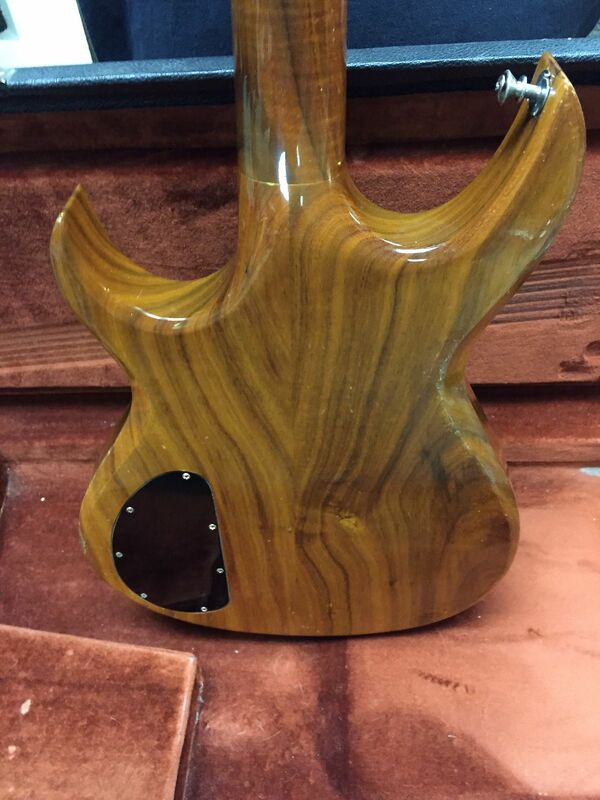 Though likely more a function of the thru-neck maple w/walnut into that slab of walnut rather than just the walnut itself, the thing will ring forever. Sometimes if I listen really hard, it almost seems like it is still ringing over there from the last time I played it . . . But, I could well have other mental quirks getting in the way of that reality too though . . . hearing things that is. 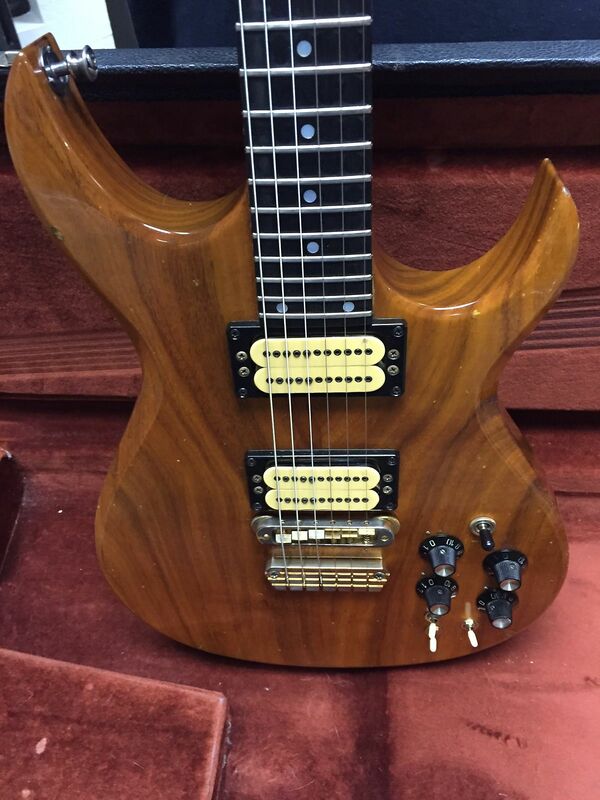 Here's a shot of my first Carvin, a Koa LB75 that just celebrated it's 20th birthday. I know... if I were going to buy a V220.. that would pretty much be the ultimate. 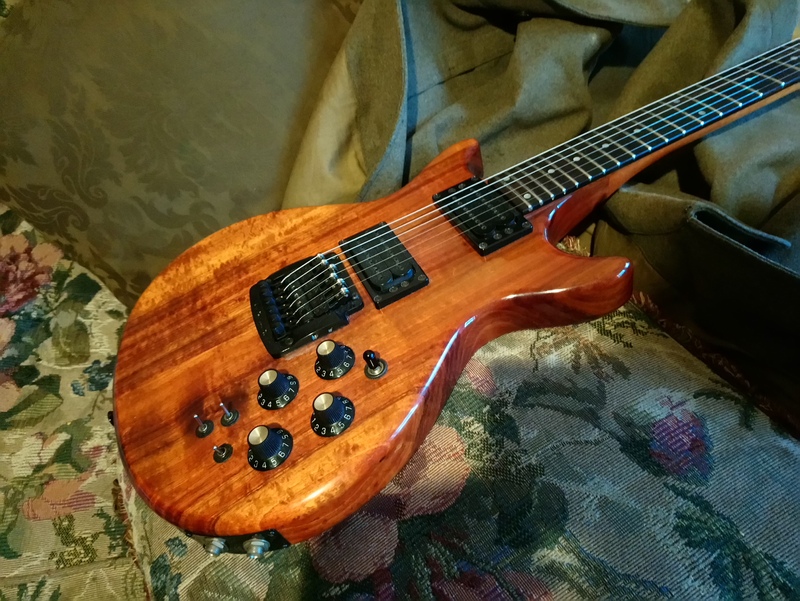 Set neck, Gibson scale, koa rather than maple (which pushes it into the mahogany zone, only better, and in terms of koa, this super-old, super chatoyant, super stripey stuff has the best odds of delivering magic), which puts the guitar right where it should be tonally (at least if you're looking for a sound in the Explorer ballpark.. this will get you there and improve in every way.. sound-wise, build-quality-wise, looks-wise, everything wise). 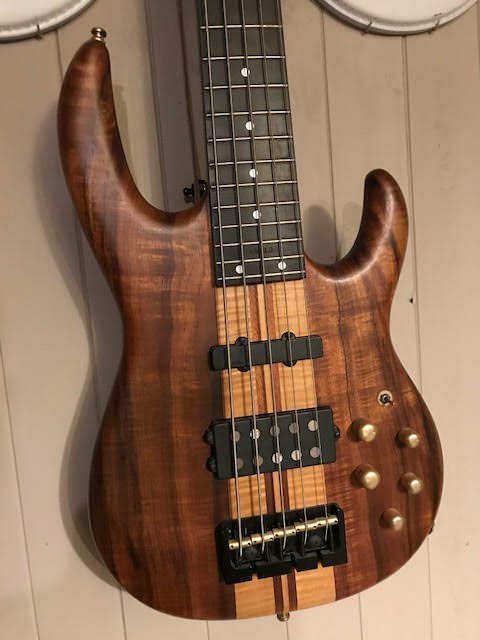 Circling back to another convo about figuring and tonewood: THIS is an area, or kind of guitar, where I think wood figuring can absolutely make a difference: the entire body wood, especially with no top and the whole slab can ring free. 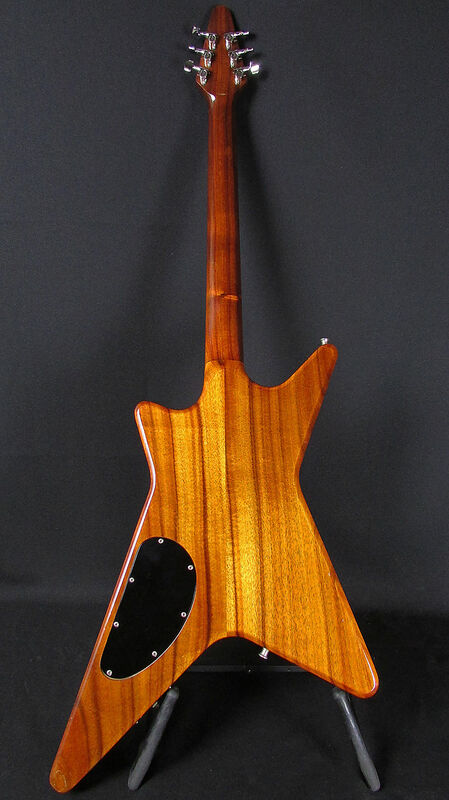 There are all different cuts and ages of koa which usually result in all different kinds of sound mileage out of a guitar. This stuff I've found tends to give the best likelihood of getting you all the qualities that the best koa is famous for. 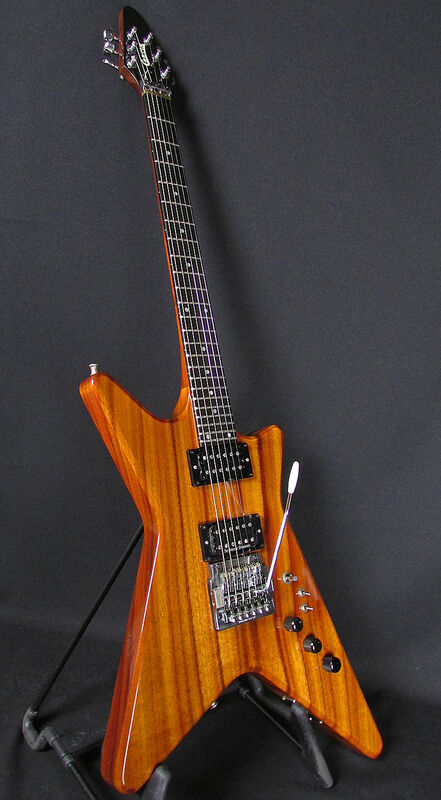 And this is the kind of guitar where I think dejablu's statement about the things Jeff said about quilt versus plain maple, creating increased midrange response of one versus the other... on a guitar like this where it's all made of that one wood, where you'll definitely experience those variations the most, from one to the other with all else being equal. 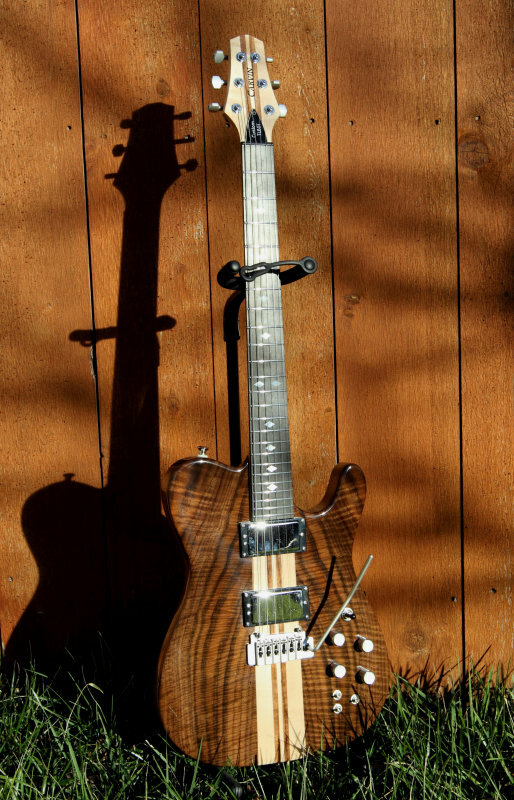 There are plain maple versions of this guitar, flamed maple, quilted maple, etc tec. And within these figuring variations you'll get those difference in focus in sound.